The old town of Lijiang China, which was a famous city in the past, is located Northwest of Yunnan Province, blessed with beautiful scenery. The old town has a long history, and a brilliant culture. It’s also an old city of national minorities rarely found in China, which has been preserved intact. The Lijiang old town is a central town located in the Lijiang autonomous county of the Naxi（纳西）ethnic minority in Yunnan province. Lijiang County is located in the northwest of Yunnan province, on the transitional tract from the southern tip of the Cross-Mountains on the Qinghai-Tibet Plateau to the north of the Yunnan-Guizhou Plateau. Affected by the south Asian plateau wind, its climate shows distinctive dry seasons and rainy season. Within the county, there live more than 10 nationalities: Naxi(纳西), Bai(白)，Yi（彝），Tibetan（藏），Miao（苗），etc. Of them, the Naxi people account for about 66.7% of the entire population there. Lijiang’s scenery are also unique and unconventional. In Yufeng (Jade Peak 玉峰) Temple there is an old, giant camellia tree of more than 500 years old, which can put forth thousands of flowers, so that it is called a “Ten-Thousand-Flower-Camellia”. Therefore it is known as “the First Tree in the world”. 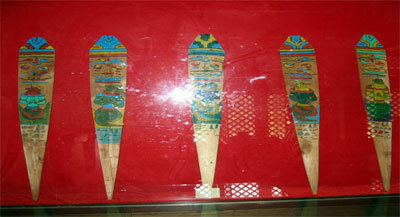 The mystical Dongba (东巴) hieroglyph is known as “the only living hieroglyph in the world”. The old Naxi music with noble elegant lingering charm is thought to be the “living fossil of the Chinese classical music”. 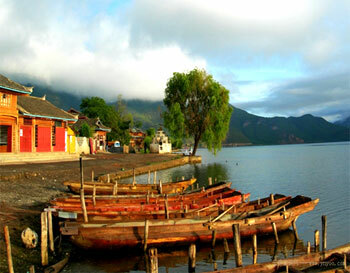 Lugu Lake (泸沽湖) with its deep and transparent water is known as “the pearl on the plateau. The Mosuo (摩梭) villages on the shore of Lugu Lake and the folk customs and the culture are unique in the world and always make a truely unique experience for tourists. There are still some matriarchal families. The Mosuo people are now still keeping the “Axia (阿夏)” marriage customs by which a young man doesn’t get married and a girl is not to be married off. The Ancient Town of Lijiang, also called Dayan (大研) Town, was first set up in the Song Dynasty（宋朝）, and has a history of almost a thousand years. The town is famous in China for its old and simple architectural style and the elegant art for the layout of the town. It’s also well-known to the world because “each of the houses is built by the stream and surrounded by willow trees”. Therefore, Dayan (大研) Town is praised as the “Oriental Venice” and “Suzhou(苏州) on the Plateau”. Sifang Street (Four Square四方街) is the center of the ancient town. Since ancient times, Sifang Street has been a collecting and distributing center of all kinds of products with travelers and traders coming and going. The Yulong (Jade Dragon 玉龙) Snow Mountains are the southernmost modern marine glaciers in the temperate zone of the northern hemisphere. There are all together 13 peaks along the range of the mountains, which stretch for over 35km from south to north. The summit, Shanzidou（Fan Steep 扇子陡）, is 5596 meters above sea level. Looked at from far away, you can see the mountains covered with snow, which look like a silver dragon with the clouds curling up in the middle. 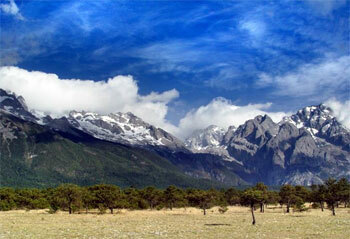 Because of this, it’s named Yulong (Jade Dragon) Snow Mountain. The old town of Lijiang today is no longer the “forgotten realm”. The warm-hearted and hospitable Lijiang people from different ethnic nationalities cordially welcome friends from both home and abroad, and the magnificent and mysterious Jade Dragon Snow Mountain is opening its arms to the world.